Adults, elderly and children over 12 years old; Take 1 tablet two or three times a day. If symptoms worsen or persist after two weeks, a doctor or qualified healthcare practitioner should be consulted. If you take more HRI Clear Complexion than you should. If you take more than the recommended dose, speak to a doctor or pharmacist. What HRI Clear Complexion contains: Each coated tablet contains 34mg of extract (as dry extract) of Burdock root (Arctium Lappa L.) (equivalent to 90-180mg of Burdock root) Extraction solvent: water, 30mg of extract (as dry extract) from Blue Flag Iris rhizome (Iris versicolor L.) (equivalent to 60-105mg of Blue Flag Iris rhizome) Extraction solvent: water. The other ingredients are: Tablet core: Sucrose, Calcium Hydrogen Phosphate, Croscarmellose Sodium, Magnesium Stearate, Purified Talc, Colloidal Hydrated Silica. Tablet coating: Sucrose, Calcium carbonate, Purified Talc, Mastercote cream FP9002 (containing beeswax, shellac, carnauba wax), Acacia, Titanium dioxide (E171), Shellac. Do not take HRI Clear Complexion; If you are allergic to Burdock, Blue Flag, Sarsaparilla, plants of the Asteraceae (Compositae) family such as daisies, marigolds or artichokes, or any of the other ingredients (see section 6); If you are have infected spots or inflamed spots which are infected; If you are pregnant or breast-feeding; If you are under 12 years old. While taking HRI Clear Complexion; If not treated adequately, acne may cause scarring. Do not use this product and consult your doctor or qualified healthcare practitioner if you have widespread redness, oozing or infected skin sores, infected or inflamed spots, if your skin is broken, or if the affected area has suddenly become inflamed. Pregnancy and breast-feeding; This medicine is not recommended during pregnancy or breast-feeding. Ask your doctor for advice before taking any medicine. Like all medicines, this medicine can cause side effects, although not everybody gets them. Anaphylactic shock (serious allergic reaction which causes difficulty in breathing or dizziness) has been reported with Burdock root, and Blue flag root may cause nausea, vomiting and irritation of mucous membranes. The frequency is not known. There have been no reported cases of anaphylactic shock caused by this medicine. If symptoms worsen or persist after two weeks, a doctor or qualified healthcare practitioner should be consulted. Keep out of the sight and reach of children. Do not use after the expiry date which is stated on the carton and labels. The expiry date refers to the last day of that month. Glass bottles; Do not store above 25 °C. Store in the original packaging. 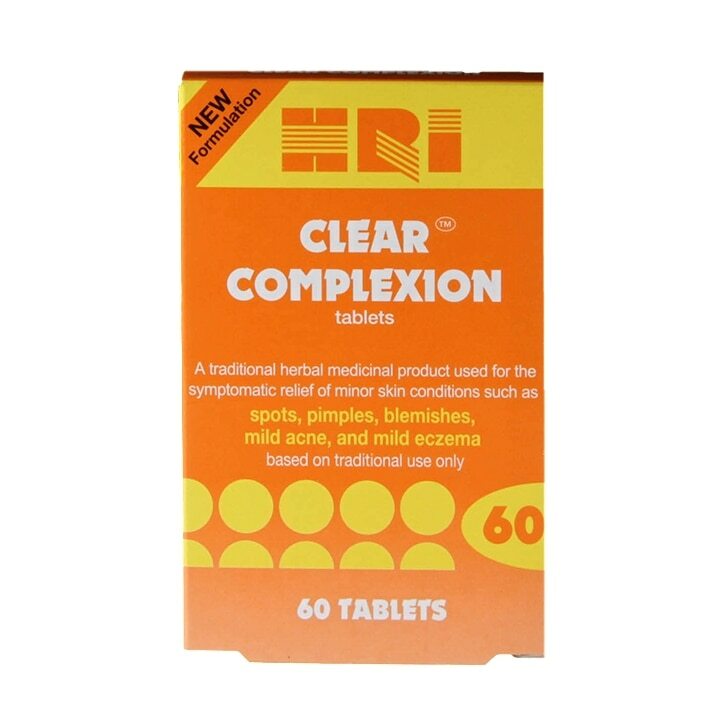 HRI Clear Complexion Tablets is rated 4.4 out of 5 by 58.